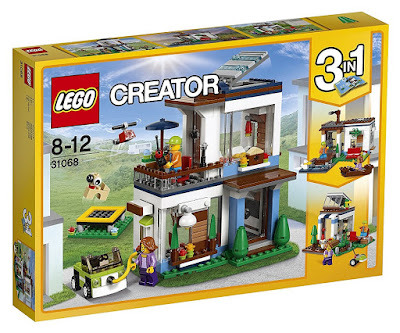 Clearly we very much enjoyed building the recent LEGO Creator Modular Family Villa, as this set is quite similar. Using the same blocky style found in the previous set, we tackled this far smaller -and far easier - build, the LEGO Creator Modular Modern Home. The smallest of the three builds detailed in the instructions, the Garden Home is an outhouse-type structure with a garden and roof-top greenhouse. But first, let's say hello to the minifigures. We get a mum and a son (or big sis and bro, depending on your choice) in the set. Both are fairly standard Creator City minifigures, useful for other builds and scenes. Mind you, we would like a young girl figure included in sets like these, as they mostly appear to be boys. Just sayin'. The pair don't possess alternate faces, but there is good printing on their backs. Basically, nice figures. Right, back to the build. The Garden Home features an entrance way with a tree (and bird) and lots of flowers dotted around. Out front is the main part of the garden, complete with googly-eyed gnome. 'Round the corner you'll find a see-saw for the pair to play on (although, due to those kid legs, the wee chap can't sit down), and a birdhouse which is built into the the building itself. ...while inside there is a workbench and other tools. There is enough space for both figures to stand up in here, but not much else. Here's a better look at what we assume to be a spray bottle and garden shears on the reverse of that hose modular section. On the roof is a pretty sparse opening greenhouse with just a couple of blooms. It's a fairly basic construction, but we think it works. 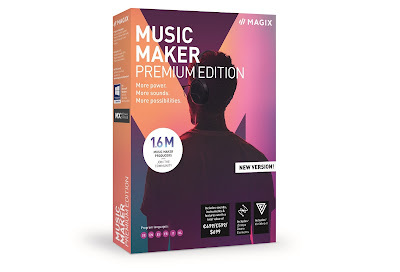 You also get this. We think it is supposed to be a robotic lawn mower (this being a 'modern' set, after all), or it could just be a regular mower with no handle. Dunno. ...something slightly different. You're a bit limited on modular sections here, what with it being the smaller build, but it is possible to re-arrange them into something else. Here we have a very dangerous See-saw. What fun! Larger, but still only drawing upon about 75% of the set's pieces, the Lakeside Home employs the bigger building section with newly built modular bits. The house's door has a small jetty that leads to the edge of (a tiny part of) a lake, complete with a duck. ...while the edge module features a very 'modern' looking window. Compare this kind of design to the traditional styles of the Family Villa windows. ...and also a sink and cooker. Minimal, but effective. Up top the roof is very plain with no actual railing or structure up there, but there is a telescope with which to gaze up at the stars. The additional build for this version of the LEGO Creator Modular Modern Home set is the simplest LEGO boat we've ever seen. There might be huge gaps in the body, but it still works to add the illusion of water in front of the home. Oh dear. Look who fell in! So, once again we trashed the smaller bits, kept the larger structures, and followed the final set of instructions to create the set's main build. Modern indeed. Aping the clean lines of modern Scandinavian architecture (we're pretty sure we saw many homes like this while in Stavanger, Norway), this house is low on curves, yet high on detail. ...while the modular windows and wall fillers seem to blend in far better here. ...a lovely little balcony, featuring a seat, parasol, lamp, flowers, and shears. Look, you can also see that birdhouse again. On the roof is a solar panel (modern, innit?) which can be angled to face the sun. It's also a skylight, meaning if the panel is lifted upwards, the bed could get rained on. Oh. ...which is actually a sweet little build in it's own right. The mum can sit in there to drive, and you can also squeeze Junior into the back. Just. ...the dog! A Creator house build wouldn't be complete without one. The Villa had one, and so did the Park Street Town House. ... we combined it with the Villa to make a mega house. It works pretty well together, and obviously if we get bored of it, we can swap the componants around to make some thing new. Nice touch, and great for imaginative play. Oh, and we've clearly got a Big Love relationship thing going on in this house. Sweet. 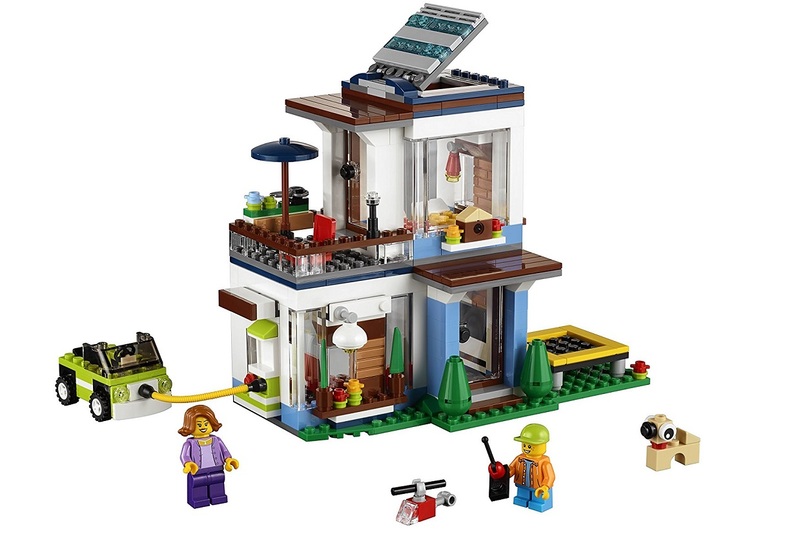 So although nowhere near as interesting as the Modular Family Villa, the LEGO Creator Modular Modern Home offers younger kids a fairly easy build with great parts and minifigures. 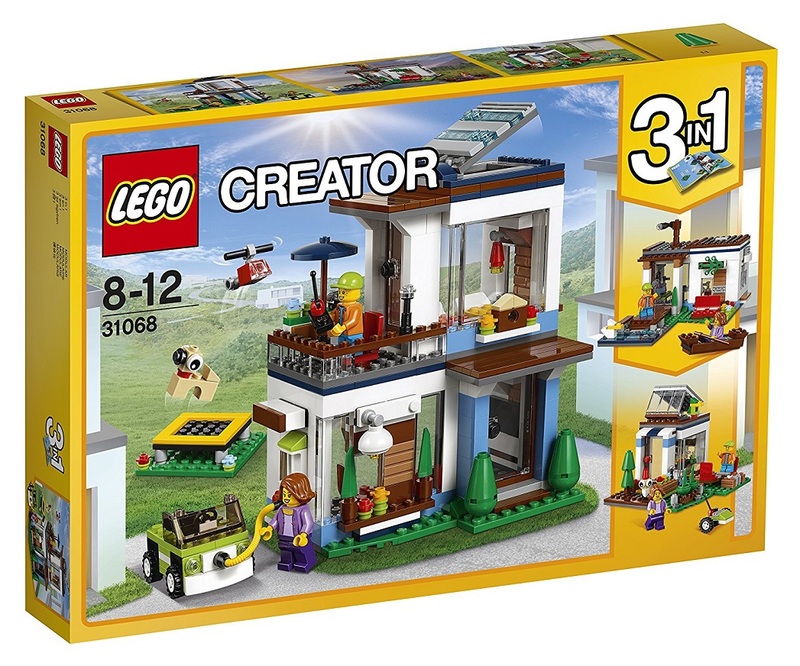 Older kids (and us) will enjoy adding the modular elements to existing builds, and we feel that, for the price, this is a worthy addition to any LEGO Collection.